Coming home to brewing equipment on your doorstep is always a great feeling! One of the best things after a long days work is coming home to some new home brewing equipment waiting for you on your doorstep! I had just placed my order with More Beer 2 days ago and the packages already arrived! 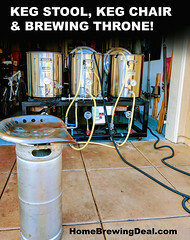 I picked up a new 10 gallon BrewBuilt homebrew kettle for small homebrew batches ( I have been using my 20 Gallon Blichmann which is a great kettle, but not really designed for 5 gallon batches), a Hop Gatherer all grain beer kit which uses the new hop oil extract and I am really looking forward to trying that out! Lastly, I picked up a More Beer Deluxe homebrew starter kit which is a Christmas gift for one of my good buddies. I figure I will try to get some of my Christmas shopping done early before things start selling out! Hopefully he will enjoy it and we will add another home brewer to the home brewing community! The kit is pretty awesome, especially for the price. 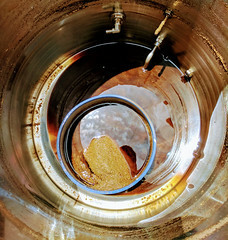 I wish that the kits were this good when I first started home brewing. 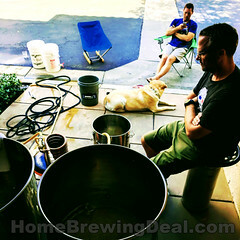 This is MoreBeer’s Deluxe home brewing starter kit and it comes with everything that a home brewing needs for their first batch of home made beer, minus the bottles. It even comes with a 5 gallon stainless steel kettle and everything is packaged in to one box with easy to follow directions. I figure I will do a ride along on his first batch to make sure everything goes as well as it can. You get all of that, including the 5 gallon American Pale Ale beer kit for just $129. 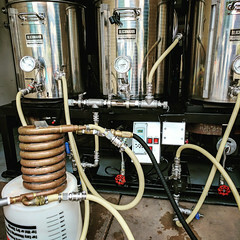 I think I may have paid close to the for my first 5 gallon brew kettle! I know that I would have been thrilled to receive it as a Christmas gift before I got in to home brewing, so hopefully he will do. I get to check one person off of my list at least. I have my best guard dog on the job to keep everything safe until the Holidays arrive.